Today is the Winter Solstice, the shortest day of the year, and in Korea, people are eating 팥죽, patjuk or a red bean porridge with sticky rice cakes. Like a lot of old customs, it’s not so strictly observed now. I don’t remember ever marking this day in any way with my family, and you can find red bean porridge year-round. But I like the spirit of this day, the idea that the redness of the beans signals some good power that will ward off bad spirits. Here in New York, we’re still buried under the remnants of this weekend’s snowstorm and the days are so short and so dark, I want to believe in some powerful beans. So what is this dish? It’s very, very simple. 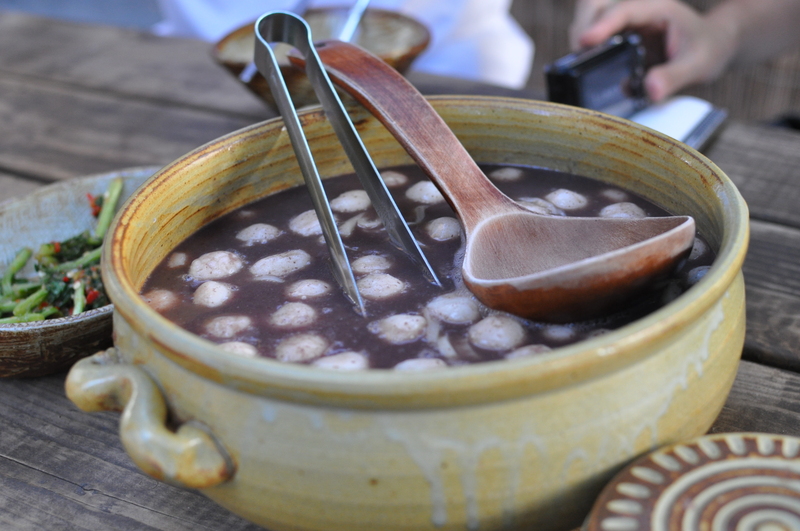 Korean pat beans (pronounced “pAHt”), also known in Japan as azuki beans, are soaked and then boiled until they turn soft. The porridge is ground or pureed until smooth, though it doesn’t have to be refined and strained. Usually, it’s served with small sticky rice cakes made out of glutinous or sweet rice, which are called sae-ahl, or birds’ eggs. There’s almost nothing else that’s added to this dish, maybe chestnuts or dried red dates if you’re feeling fancy. Sugar or honey is added if you like it sweet, but there are those who just like that earthy, bean flavor and want nothing more. At its best, it tastes like purity and wholesomeness. Not the kind advocated by religious fanatics, but the kind that makes the other little details of life sharper. At least that’s what I think, because the best patjuk I’ve ever had was in a little town in the mountains under a persimmon tree. The day was still warm, and we sat down on the wooden table outside. 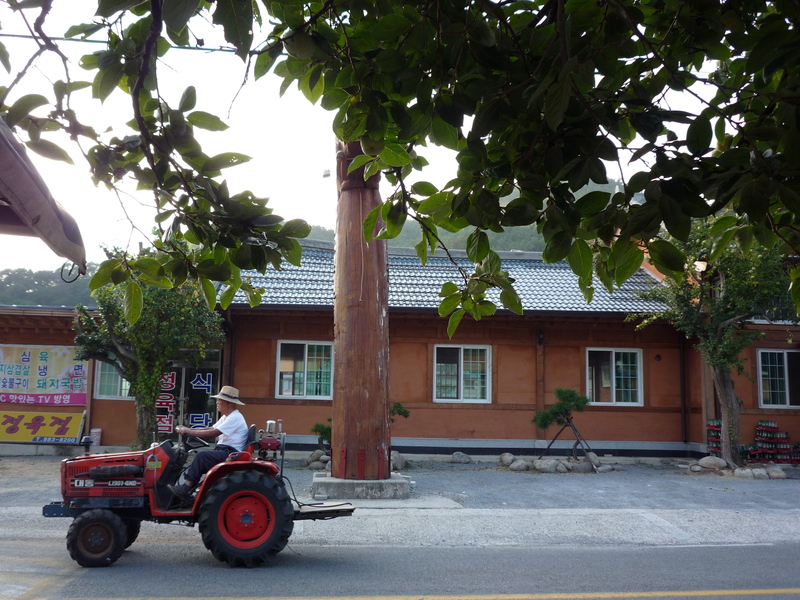 It was a lucky find for us, recommended by the Buddhist layperson who had prepared our lunch. She had told us, almost clutching her heart, that it was the most delicious patjuk in the world. (Just because they’re Buddhists doesn’t mean they don’t take joy in sensual pleasures.) 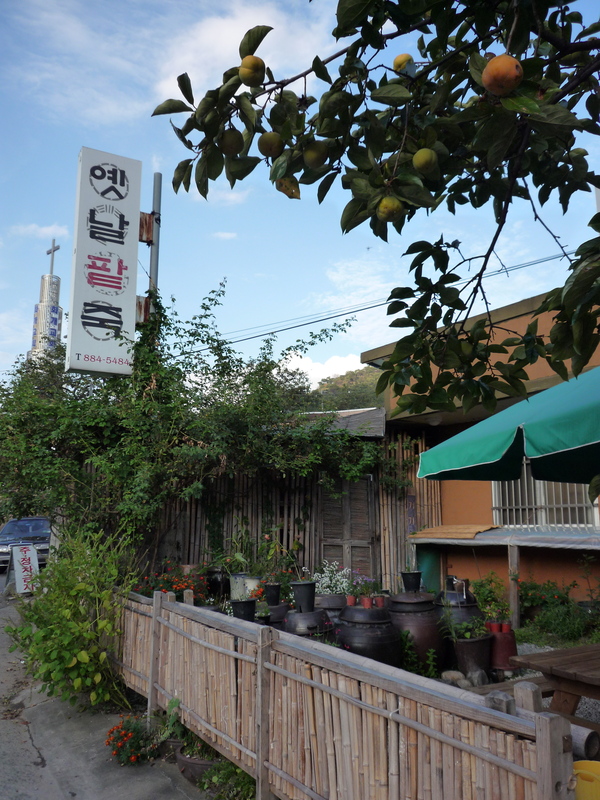 But with vague directions and the assurance that we would simply find this 옛날팥죽, or Old-Fashioned Red Bean Porridge, we hadn’t been counting on it. The restaurant was short and squat. Inside, there was a cast-iron stove, rough wood furniture, and a tiny piano. Outside were jars of doenjang, gochujang, the essential condiments of Korean life, with flowering plants piled around and on top, a garden of pastes and blossoms. The food was served in the kind of traditional pottery I love most, thick, strong, and effortlessly functional. I saw some paintings this weekend that reminded me of these plates–how good do you have to be to make something that looks so casually right? The woman who served us wore a skirt with natural dyes and a deep purple sweater. She was beautiful, with an aesthetic you don’t see much in Seoul these days but is still popular in Korea. Modern Koreans aren’t so good at living harmoniously with nature, but there’s still some persistent hope, I suppose, that it’s possible. 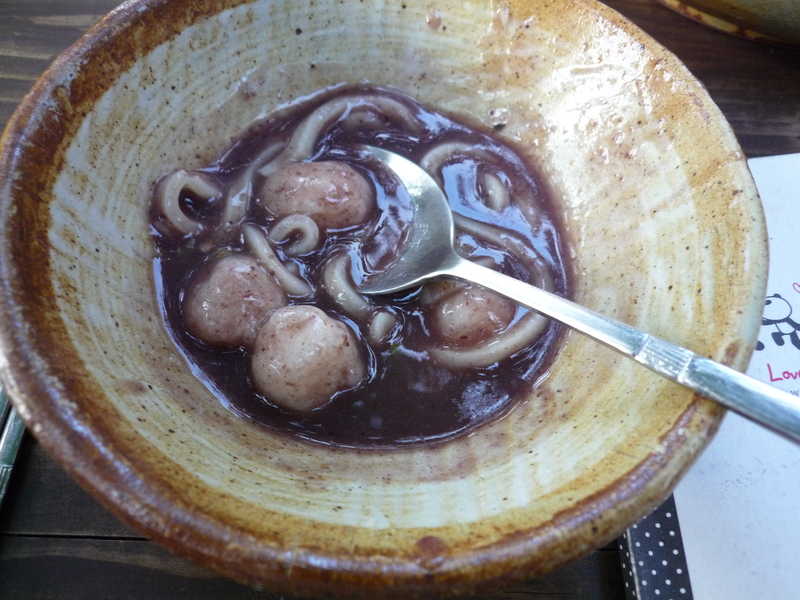 We ordered a big bowl of patjuk with both sticky rice cakes and kalguksu or knife-cut wheat flour noodles. I’d never had kalguksu with patjuk before, but it was surprisingly good. They tasted even chewier and more delicious in contrast to the smoothness of the beans. The patjuk came with a little bowl of light brown sugar to add to taste, which meant we could see the flavor change from earthy to round. The kimchi was very good, too, lightly salted with just a slight sourness that made us want to eat more of everything. We were very happy. It would be good to have those powerful beans now.